Ramanathpuram: TN Minister for Information and Technology, Dr M. Manikandan, has warned of severe action against Local Cable Operators (LCOs) conspiring against Arasu Cable TV Corporation by joining hands with private MSOs, causing revenue losses for the state owned Cable Corporation. According to the Minister’s version of briefing, Arasu Cable TV (TACTV) has 70.52 lacs subscribers who are being serviced by 16, 549 Local Cable Operators. As, on dare the Corporation has seeded 30 lacs SD Set-top-Boxes and 12,000 HD Set-top-Boxes. The IT minister accused that many LCOs are falling prey to attractive short term discounts extended by the private MSOs and ditching Arasu Cable Corporation, thus resulting in loss of subscription and other revenue possibilities for TACTV and he warned that license of such erring operators will be cancelled. 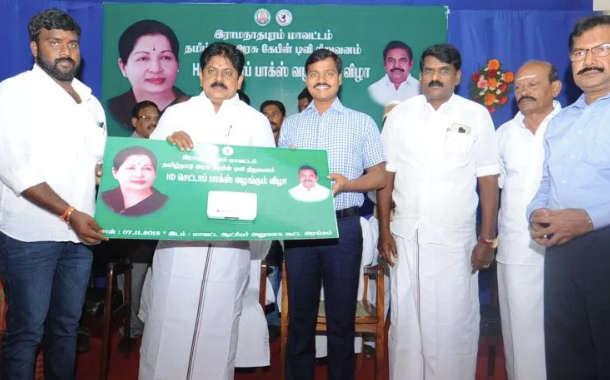 Moreover, he also advised subscribers to stay with Arasu Cable to enjoy other benefits like Free Internet connection for Free Laptops distributed to students in government schools. While the Arasu Cable TV is battling to retain its subscribers with Free STBs. Competing private MSOs and DTH Operators are also extending free STBs with lower monthly tariff options as low as Rs 100 per month. Cable Operators associated with Arasu are worried about limited tariff plans that starts from Rs 250 per month, while few DTH Operators are snatching their subscribers with lower Basic Regional Language packages customized for the respective regional subscribers. Sources from Operator’s association that is working closely with TACTV has revealed that they expect Arasu to introduce a Basic Tamil Channel package with monthly tariff of Rs 100 failing which will result in migration of lacs of subscribers to DTH platforms that are wooing their customers with temporary seasonal offers.